Coalition members at the table include, left to right: Anthony Spearman; Brent Childers, executive director of Faith in America; Wayne Besen, Truth Wins Out’s Executive Director; Mitchell Gold, founder of Faith in America; and Jack McKinney, a former pastor and counselor. 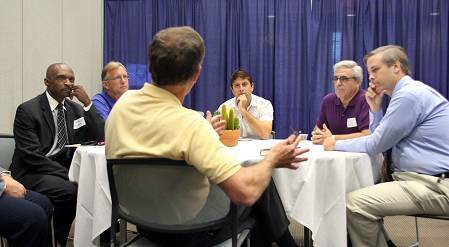 The meeting took place June 15 at the Phoenix Convention Center between sessions of the Southern Baptist Convention Annual Meeting. A coalition of homosexual leaders and their allies met for more than 30 minutes Tuesday with Southern Baptist Convention President Bryant Wright, with the leaders demanding an apology from the SBC and Wright refusing to budge, saying that Scripture is clear on the issue.